Music video for "Hey Girl." Although known as the "Piano Man," Billy has a soulful voice that is featured on this song. 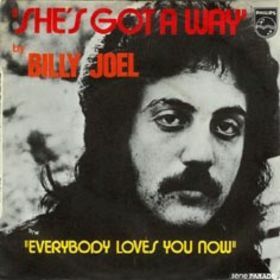 The second cover song that Billy recorded for Greatest Hits III in 1997 was "Hey Girl." The song was written by Carole King and Gerry Goffin and was made popular in 1963 by Freddie Scott. Scott's version reached number ten on the pops and R&B charts. It is a slow moving ballad about the desperation the singer feels about an impending breakup. He is trying to convince his lover to not leave, even to the point of begging her to stay. Ah, the things we do for love. Billy has stated, however, that he recorded it a few years earlier with his daughter in mind, and how he would miss her due to his divorce from Christie Brinkley. (From H. Borodwitz's biography on Billy Joel). Billy acquits himself very well as a soul singer, channeling the R&B songs of his youth. One wishes he had done more covers of soul and R&B songs. His cover of Sam & Dave's "You've Got Me Hummin" (the B-side to "Tell Her About It" in 1983) is a gem but you can't find it on any album, not even My Lives. You can, however, see and listen to Billy discuss the song as he inducts Sam & Dave to the Rock and Roll Hall of Fame in 1992. Billy knows his rock music history. When Carole King received the Gershwin Award for Popular Music and was honored at a White House ceremony in 2013, Billy sang King's song "The Locomotion" (see video, right) and thanked her for inspiring him. Every singer-songwriter should be issued a copy of Carole King's Tapestry. This is Freddie Scott's version of Hey, Girl which reached the top ten in 1963. Carole King has her own version, including this live one here. Billy performs "The Locomotion" in Carole King's honor at The White House in 2013. He later thanks her for contributions to popular American music here.